300 Lb to 2,000 Lb Chocolate Melters & temperers - Savage Bros.
Our large batch tank line offers chocolate melters, conditioners and temperers in batch sizes of 300, 450, 750, 1250 and 2000 Lb capacities. 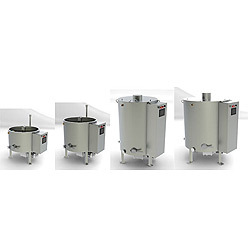 The tanks are water-jacketed stainless steel construction with digital controls for melting & conditioning or tempering. Standard voltage - 220V /60 HZ 3 Phase or 440V/50 HZ 3 Phase. Single Phase available. Footprint 41" x 33" 41" x 33" 41" x 33" 48" x 43" 55" x 53"
Height to Top Lip of Tank 30" 37" 52" 51-1/2" 51-1/2"
Tank Outside Diameter (OD) 29-3/4" 29-3/4" 29-3/4" 38" 47"
Height of Draw-Off Valve 14-1/4" 14-1/4" 14-1/4" 14-1/4" 14-1/2"